Short Story Long: Election Day! Today is election day here in the U.S! 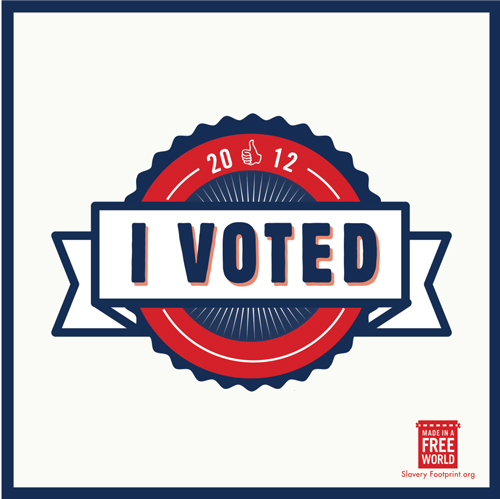 We vote for the president of the United States, as well as other local government officials, propositions, and measures. This is a fun day for our citizens and I enjoy being a quiet voter. What I mean is that I like to vote, I just don't like to tell everyone who or what I am voting for. I've been conditioned to avoid having those conversations and discussions publicly. Is that a good thing? I think it is. I think that people have become bold by the anonymity of the internet and replace face-to-face conversation with status updates and tweets. If you have a Facebook account, I'm sure you've seen plenty of friends expressing their viewpoints on a range of issues. I'm all for people exercising their freedom of speech, however, if you are striving for a meaningful dialogue on the issue, I don't think that is an appropriate forum to conduct it. With politics, religion, or any other personal topics, I believe you need to have a trusting relationship with your audience in order to have a productive conversation on the topic. That's why bull-horn guys on street corners don't work; they don't have any legitimacy in the lives of the people they are condemning. I think the same goes for social media rants. Yes, these people are technically your "friends", but how many of them do you have a close enough relationship with to have an honest conversation? Where you are willing to listen? I'm sure you have some (as I know I do), but I am not comfortable having these kinds of conversations with the few hundred other "friends" from behind a computer screen. I'd rather be able to read their body language, hear their tone of voice, and take note of any awkward tension. I realize that it is a lot less convenient, but most productive things are. What are your thoughts? Do you think social media is the right platform to stir conversations? I'd love to hear (and I'll still love you no matter your answer :)! I try to keep my opinions to myself, unless like you mentioned I'm talking to someone I know is listening (not necessarily agreeing...it's okay to disagree).